Deadline: Wednesday 15th May 2019 3.30pm CST to Mary MacKillop Memorial School reception during school hours and have entry form attached. The intent of this new competition is to seek entries of rock art depicting animals/birds (fauna) of the Limestone Coast. The winning entries will be used for public display in the Town Square and other public garden areas. Entries are to use any type of rock found in the Limestone Coast. This could be from home or from other areas (respectfully sourced). Entries must have the title (name of the animal/bird), type/s of rocks used, entrants name and contact details clearly displayed on a cover page. Entries must adhere to the criteria 2019 set out below. Entries are to be delivered in person to Mary MacKillop Memorial School reception during school hours and have entry form attached. The winner will be announced as part of the Penola Coonawarra Arts Festival at Mary MacKillop Memorial School, prior to the Kids Open Mic Competition (1pm). The Penola Coonawarra Arts Festival Committee reserves the right not to display any entry without explanation. The judges decision is final and no correspondence will be entered into. The prizes will be a certificate and the public display of the rock art in the Town Square. All entries will be displayed publically for two weeks post festival and entrants will be contacted for pick up. The criteria for the 2019 Rock Art Competition is a piece of work, using rocks collected and found, that depicts the fauna (animals/birds/marine life) of the Limestone Coast. This is inclusive of native and domestic fauna, as well as livestock and farm animals that are found in the Limestone Coast. One animal/bird per piece. Choose an animal/bird and find a photo that you can easily make with rocks. Collect board base (30 x 60cm) from Penola Primary School Reception (during school hours) WOOD AVAILABLE FROM 29th APRIL 2019. Collect rocks or stones from your home or community. Please be respectful when collecting and ask permission if need be. Collect different shapes and colours and sizes. 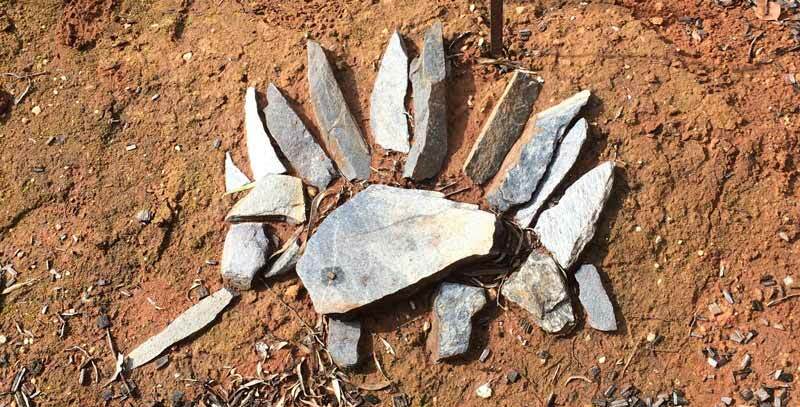 Experiment with the rocks/stones in the shape of your animal/bird. When you are happy with the position glue the rocks securely onto the board base. Allow to dry properly before moving. Fill in the entry form and deliver with art to Mary MacKillop Memorial School (MMMS) between the 8th of May and the 15th of May (closing at 3.30pm). View all entries on the Arts Fest weekend (18th and 19th May) at MMMS Hall. Winners announced at 1pm Sunday on MMMS Oval Marquee. Note: We recommend a glue that will adhere rocks to wood. Liquid Nails Clear or similar product would be a good option. What did you think of the 2018 Festival? Have your say!